« Denie Wants You to Czech Her Out! Happy Friday! Have you seen all the new design submissions on metalinkshop.com? Rate your favorites and help decide which ones get printed! Remember, for each design that wins, you get $700 in cash, $300 in store credit, plus residuals from t-shirt sales! Go to the Rate Designs page today! MI: Hi Mike, thanks for joining us on Metal Ink Crew Musings. 1st Amendment has 4 locations—are you at the shop in Temecula? Mike: Yeah but I’m actually from Boston. I got out to California about 15 years ago. I’ve been tattooing for 19 years total. It was illegal back then in Boston, New York, all of Massachusetts. I got involved through the hard score scene first in Georgia, then I went to Minneapolis. MI: Was it also illegal to tattoo in Minneapolis? Mike: In the 1970s it was a different age and instead of regulating it they outlawed it. Actually, South Carolina just legalized just 2 years ago. But I came out west to do build my mecca, learning and earning. MI: Because here, it wasn’t outlawed? Mike: It never was illegal in California. It was illegal in places where there were high concentrations of military. Places like New York, South Carolina, Eastern seaboard. 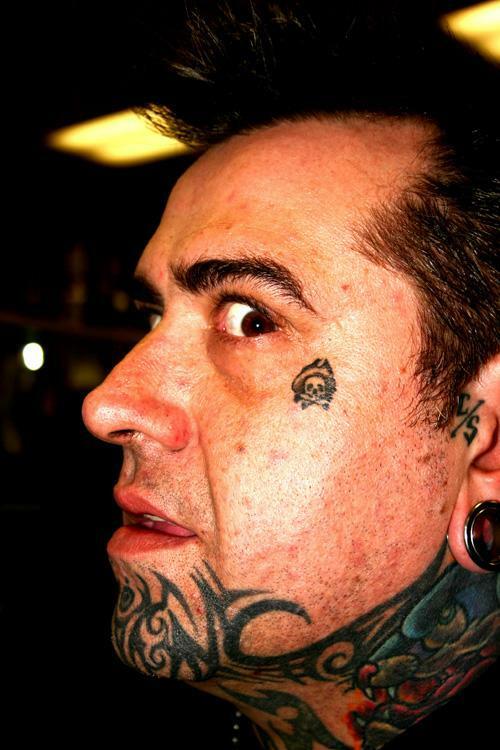 When hepatitis started going around, due partly to tattooing, it became outlawed. California actually has the least amount of regulation. It’s regulated county by county. Every state is different, there are no federal regulations. MI: Okay, thanks for the history lesson. So your nickname is “The Reverend”—where does that come from? Mike: It’s just a little moniker. Actually, I’m ordained and I do weddings. It’s through the Universalized Church which is a non-denominational church. I’ve never done a funeral but I’ve done 30 weddings. MI: How people find you? Mike: Through friends of friends, word of mouth, it’s really random when they hire me. MI: Can you tell us an interesting story? Mike: Once I went to a wedding where everybody hated the bride, couldn’t stand her. They had set up to do an elaborate candle ceremony. The brother-in-law shoved the bride, shoved her into the table. The bride was crying, oh my god, and the husband was yelling in her defense. Mike: I also did a swingers wedding in Newport Beach. All the guests were scantily clad, in bikinis and banana hammocks—it was very uncomfortable. It was at a really secluded spot on the beach. MI: Did they require a dress code? Did they ask you to wear a Speedo? MI: Tell us about your shop, 1st Amendment. Mike: We’ve got 4 locations now, plus I organize 2 tattoo conventions, one in Bakersfield and one in Georgia. I also have a tattoo supply company. I build machines. MI: Oh wow, 2 conventions? Just that alone could be a full-time job. When do you find time to tattoo? Mike: I tattoo 3-4 times a week, but it used to be 7 days a week. I have a family now, which leaves not enough time, no walk-ins—I’m pretty selective about the work I do. Even still, I’m often up until 3 in the morning doing a layout. Pretty much everything I do is about this business. All my hobbies, my friends, all through this business. MI: Tell us about your style. Mike: Big, bold and clean. 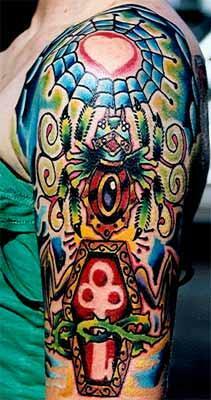 I want to do tattoos that will look good in 10 years. 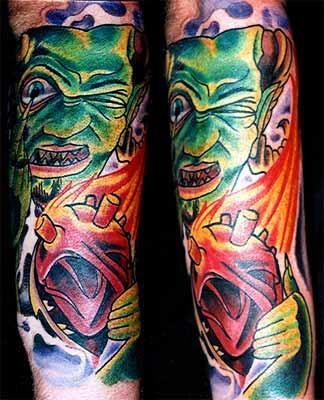 Nice hearty tattoos. I don’t want to do things that will look faded or weird. The photos you see on my website, of sleeves, bold colors—all that’s 4 years old but it looks new. I like doing stuff that’s solid and stands up. In terms of inspiration, I get a lot from traditional, mixed with a little bit of horror movie, the old monster cars, Big Daddy Ed Roth. MI: What’s your next move? Mike: Getting some rest. *Laughs* I’m going to be the emcee for Musink. It started 3 years ago, and Kat Von D was the host of it, Atreyu and Danzig headlined. This year, The Cult is headlining, we’re having professional skateboarders, 300 tattoo artists…it’s at the Costa Mesa fairgrounds, February 19-21. 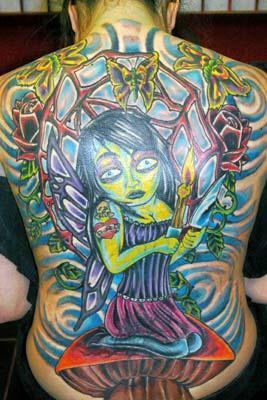 Also check out Central Valley Tattoo Expo, happening May 1-2. MI: Great, with all these tattoo conventions coming up, we hope you have time to get in a design or two at Metal Ink! Thanks for your time! 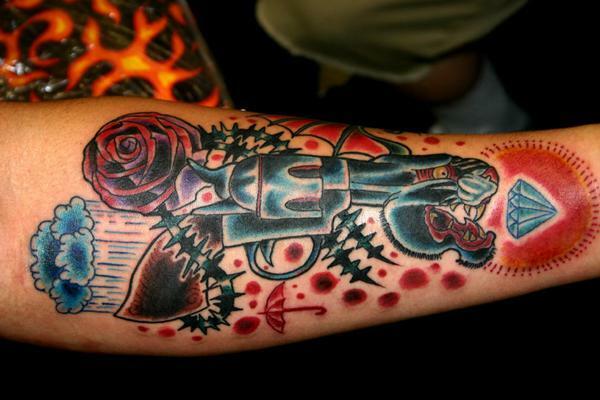 This entry was posted on December 19, 2009 at 1:33 am and is filed under Tattoo Artist Interviews with tags 1st Amendment, Musink, tattoo artists. You can follow any responses to this entry through the RSS 2.0 feed. You can leave a response, or trackback from your own site.